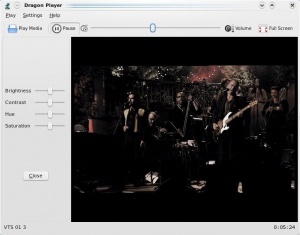 DragonPlayer is the default movie player of KDE SC 4.x. It was previously known as Codeine. Select Play Disk and your music begins. No distracting playlist, just sound. Play File opens a dialogue to allow you to find and play single files. A playlist can be built, but this isn't the primary function. This page was last modified on 12 December 2010, at 13:32. Content is available under Creative Commons License SA 4.0 unless otherwise noted.